Roman blinds, or Roman shades, are fabric window blinds that are made for privacy and to give a unique look to any room. Measuring a window correctly for these blinds is essential, because incorrectly sized Roman shades will not fit in the window, and many companies do not accept returns for custom orders. There are two ways of measuring the window, depending on whether the installation is inside or outside the window frame. Most roman blinds are considered inside installations, meaning they fit within the window frame. These measurements must be very exact, even being 1/16” or 1/8” off can keep the blinds from fitting correctly into the frame. Width is the most important measurement, because longer or shorter blinds will still be able to fit into the window, albeit not perfectly. Take a measuring tape and measure the very top of the window frame. Do not measure the outside of the window frame; place the measuring tape inside the frame. Most windows have the same width whether they are measured from the bottom, middle, or top. However, since some windows may not have the same width for the entire length, it is best to measure at the top; this is because the Roman shades are installed at the top of the window. The length measurement does not have to be as perfect, so there is less pressure, but a Roman shade that is too short or long can look awkward. Place one end of the measuring tape against the inside top of the window frame, and run it down to the bottom edge of the window. This is the length measurement. If the blinds are an outside installation, or mounted outside the window frame, then the measurements do not have to be perfect. This is because the shades’ bar does not have to worry about butting against the window frame. Though the measurements do not have to be perfect, having measurements that are too short can prevent the blinds from being installed correctly. As with inside installations, width is the most important. Use a measuring tape to measure the top of the window frame, but from the outside of the frame. Do the same for the length of the window. Now, add one or two inches to the measurement for both the width and length. 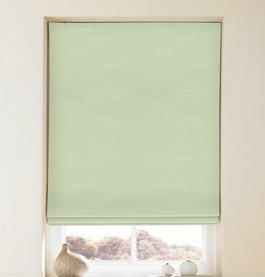 The blinds measurements are increased to ensure that the blind can cover the window entirely. Adding more than two inches is usually unnecessary, unless larger shades are desirable. Regardless of whether the measurements are for inside or outside installations, a W or L—for width and length—should be written near the measurement, so the Roman shade business knows which measurement is which. While a professional is usually best at measuring for Roman shades, and should be used whenever possible, measuring the blinds without a professional is not too difficult if done with care. Just be sure that the measurements are exact, and there should be no problems! This entry was posted in Furniture and tagged roman blinds. Bookmark the permalink. ← Why Choose Wooden Blinds?